University of Toronto scientists are members of the global team that has won the prestigious 2018 Gruber Cosmology Prize from the Gruber Foundation. The prize, which comes with a US$500,000 award, was presented late last month to two European researchers and their consortium of global scientists who planned, developed and analyzed the data generated by the innovative Planck observatory spacecraft. The project deepened human understanding of the evolution of the universe, and our knowledge of what it is made of and its geometry. Leaders of the U of T team on the Planck project included University Professor J. Richard Bond and Professor Peter Martin of the Canadian Institute of Theoretical Astrophysics, and Professor Barth Netterfield (pictured left) of the department of astronomy and astrophysics. Several post-doctoral researchers at U of T also participated in the project. The Planck spacecraft was launched by the European Space Agency in May 2009 after many years of planning. It reached its orbit 1.5 million kilometres above Earth a few weeks later, ready to look into the deepest, darkest parts of space. It had two instruments examining different ranges of the low end of the electromagnetic spectrum – one examined far-infrared radiation, and the other looked at microwaves. The Planck observatory’s two components worked for about 30 months – much longer than expected – and parts of it operated until October 2013, when it was finally shut off. The data from the spacecraft’s sensitive instruments helped shed light on the origins of the universe, how it has evolved into its current structure, and what it will look like in the future. Specifically, the Planck data provided highly accurate analysis of the remnants of the radiation that filled the universe right after the Big Bang. This Cosmic Microwave Background (CMB) has now been mapped in great detail, giving us much more information about the 13.8-billion-year life of the universe. There were about 300 scientists around the world working on the project, which involved researchers at U of T, the University of British Columbia and participation of the Canadian Space Agency. The Gruber award to such a big group is a recognition that many major scientific endeavours increasingly require the participation of – and financing from – large numbers of individuals and institutions, said U of T’s Bond, who individually won the Gruber Cosmology Prize in 2008 for his work on the CMB. The Planck experiments essentially helped scientists to “peer into what the structure was like in the earliest possible moments of the universe, in great detail,” Bond said. One of Canada’s main roles in the project, he said, was to develop software that analyzed data as it was received in real time from the spacecraft, validate it, and decide if any changes needed to be made to the way it was being gathered. Results of the experiments were published in major releases beginning in 2011. 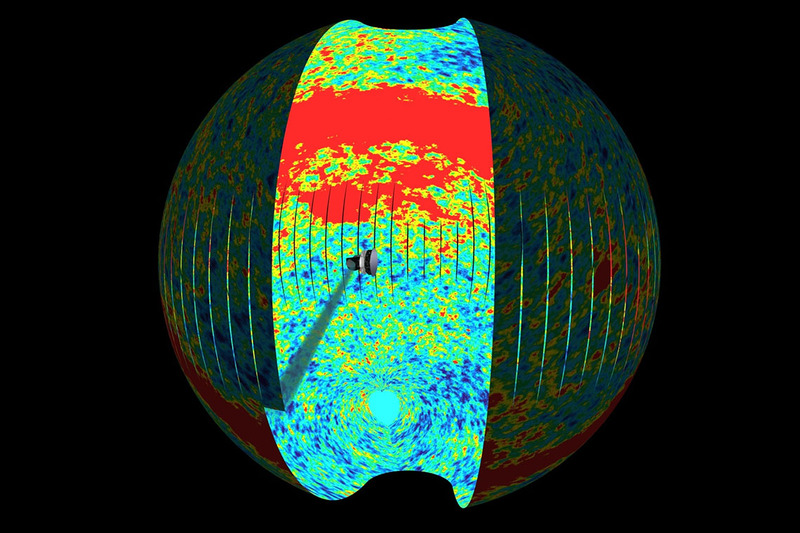 In 2013, the Planck group published a map of the CMB, essentially showing what the universe looked like in its earliest state. The latest data release was in July of this year. “This is beautiful science of a most fundamental nature” that gives us a better picture of the origins of the universe, said U of T’s Martin (pictured left). “This relates to questions that all of us humans think about, such as ‘How old is the universe?’” The Gruber Cosmology Prize is an important endorsement of this work, he said, and is considered among the top awards space scientists can receive. Among its other findings, Planck showed the universe is slightly older than earlier measurements, and it confirmed that ordinary matter makes up just 4.9 per cent of the universe – the rest is little-understood “dark matter” and “dark energy.” It also provided valuable data about interstellar dust and magnetic fields in our own galaxy. The Gruber Cosmology Prize is awarded by the Peter and Patricia Gruber Foundation, which is based at Yale University in New Haven, Conn. It is one of three prizes awarded annually by the foundation — the others are in genetics and neuroscience.